The Sculpture Park collection includes four iconic Shuttlecocks as well as recent additions by Roxy Paine and Robert Morris. 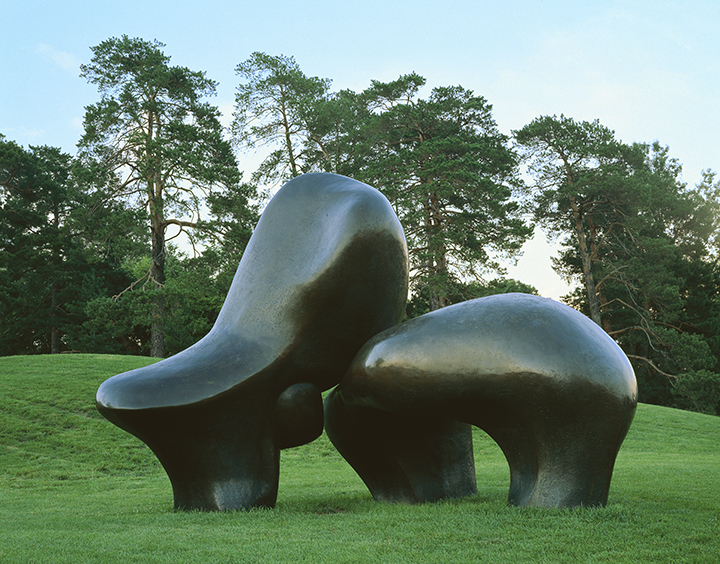 The collection began in 1986 when the Hall Family Foundation acquired 57 works by artist Henry Moore. In 1989, 10 additional Moore sculptures were acquired and joined the artist’s Sheep Piece (on loan from the City of Kansas City) and Relief No. 1. 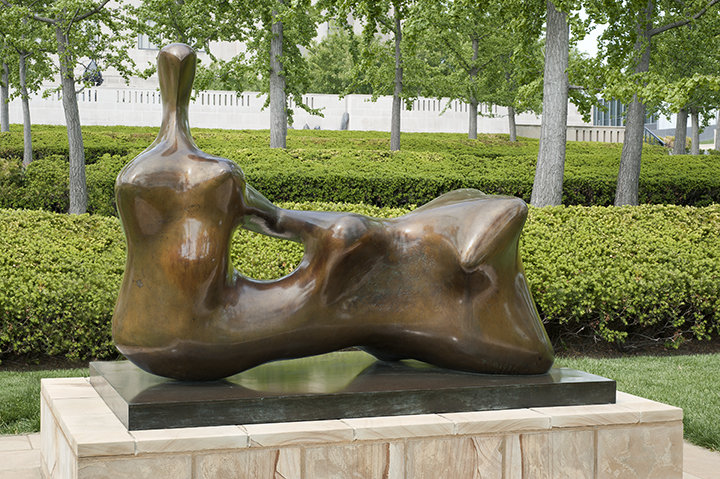 The park was aptly named the Henry Moore Sculpture Garden. 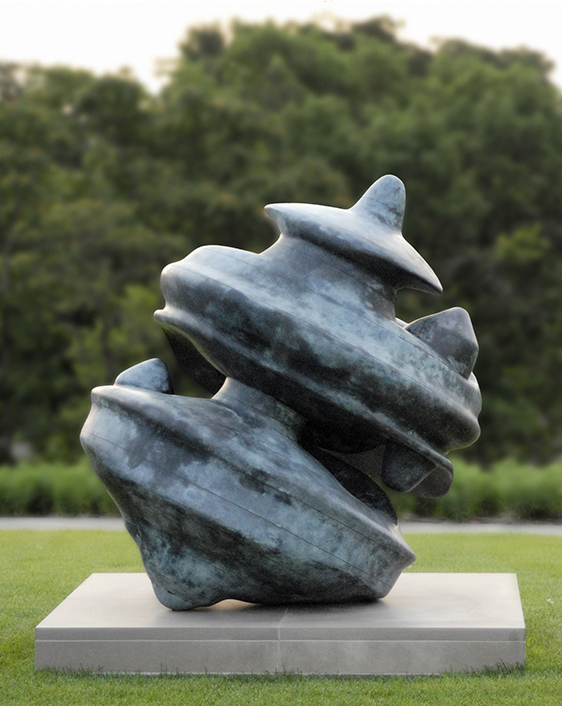 The Hall Family Foundation’s Modern Sculpture Initiative began in 1992, and the collection rapidly grew. 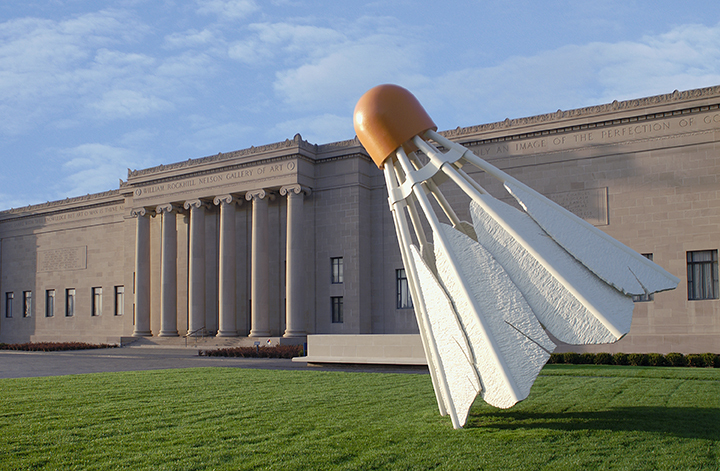 Claes Oldenburg’s and Coosje van Bruggen’s site-specific Shuttlecocks, a generous gift from the Sosland Family, were completed in 1994. 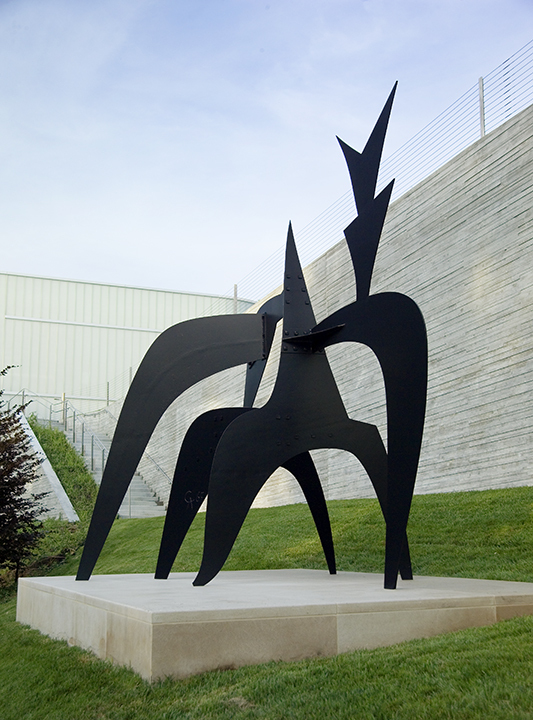 The acquisition of sculptures by numerous artists in the 1990s called for expansion. The garden became the Kansas City Sculpture Park in 1996. The tenth anniversary of the Kansas City Sculpture Park was a momentous occasion. At this time the Hall Family Foundation announced the extraordinary donation of all the Foundation’s previous acquisitions—84 in all—to the museum. 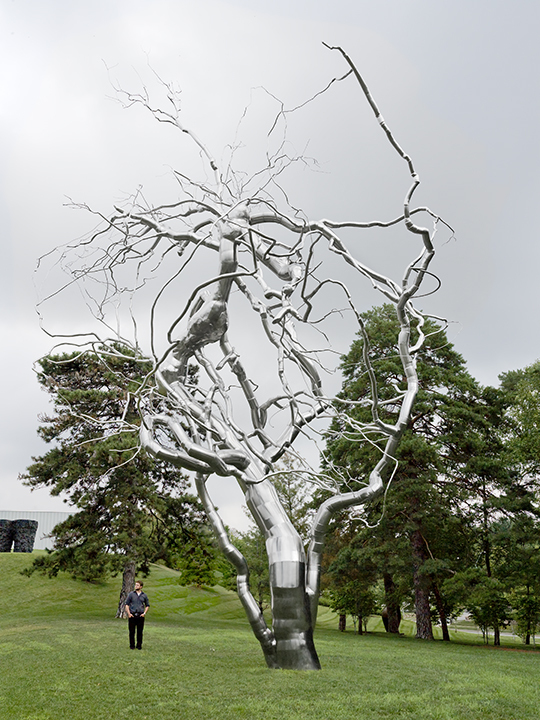 Ferment, Roxy Paine’s stainless steel, tree-like dendroid, was installed in the park in 2011 to honor Martin Friedman’s retirement as the Foundation’s art advisor for 20 years. 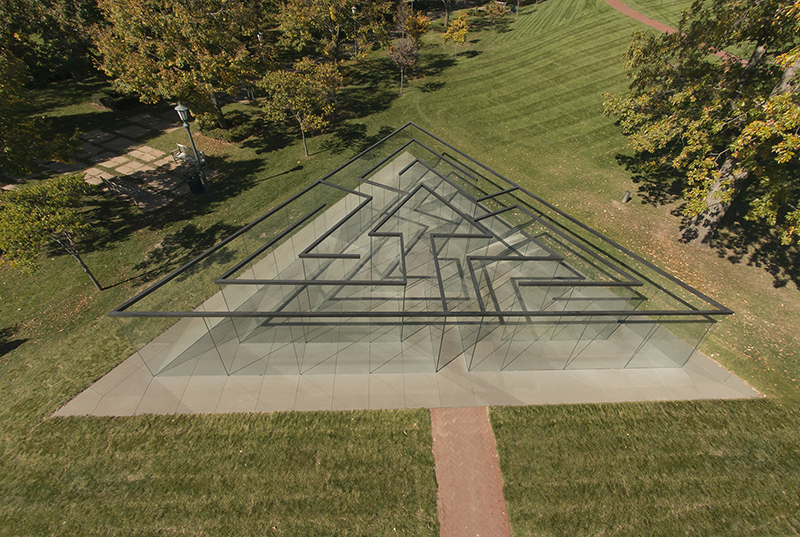 The Glass Labyrinth, by Robert Morris, was a major commission in 2014 to mark the 25th anniversary of the Sculpture Park, which was renamed the Donald J. Hall Sculpture Park. Glass Labyrinth represents Hall’s continued philanthropy toward the museum over the last several decades through gifts of sculpture and other works of art for the collections. George Segal, American (1924-2000). Rush Hour, 1983; cast 1995. Bronze, ed. 5/5. A: 5 feet 4 1/2 inches x 20 inches x 19 inches, B: 6 feet 1 inches x 25 1/2 inches x 25 3/4 inches, C: 5 feet 8 1/2 inches x 22 1/2 inches x 15 inches, D: 5 feet 10 1/2 inches x 23 inches x 20 1/2 inches, E: 5 feet 9 3/4 inches x 20 inches x 21 inches, F: 5 feet 8 1/2 inches x 20 1/2 inches x 22 1/2 inches. 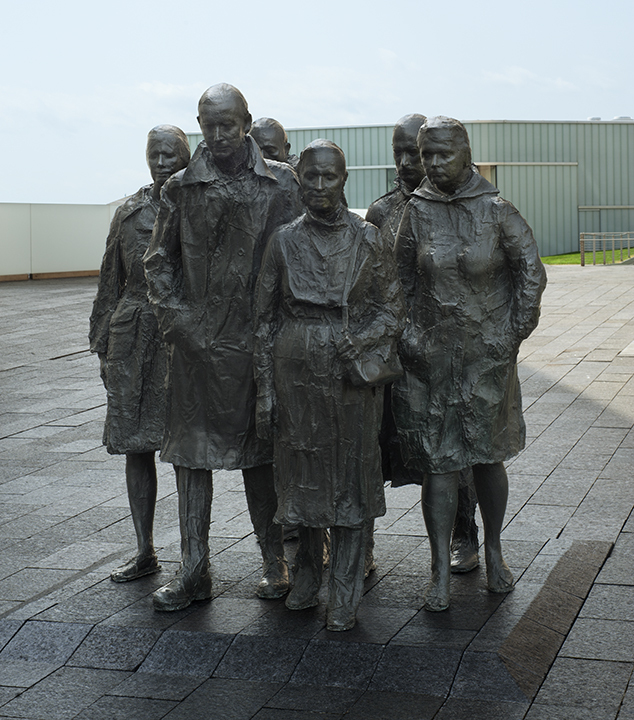 Gift of the Hall Family Foundation, F99-33/75 A-F. Art © The George and Helen Segal Foundation/Licensed by VAGA, New York, NY. Mark Di Suvero, American (b. China, 1933). Rumi, 1991. Steel with paint, 24 feet x 8 feet 9 inches. Gift of the Hall Family Foundation, F99-33/5. 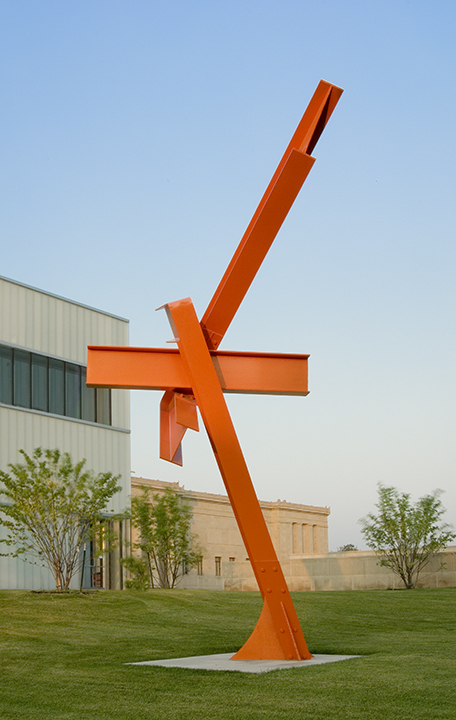 © Mark di Suvero. Claes Oldenburg, American (b. Sweden, 1929), Coosje van Bruggen, American (b. The Netherlands, 1942-2009). Shuttlecocks, 1994. Aluminum, fiberglass-reinforced plastic, paint, h x diam: 19 feet 2 9/16 inches x 15 feet 11 7/8 inches. Purchase: acquired through the generosity of the Sosland Family, F94-1/1-4. Donald J. Hall Sculpture Park. This work is copyrighted. Consult copyright information for permission to reproduce. Alexander Calder, American (1898-1976). Tom’s Cubicle, 1967. Painted steel, 10 feet x 12 feet x 7 feet. Gift of the Friends of Art, F69-7. This work is copyrighted. Contact Artists Rights Society (ARS), New York. Roxy Paine, (b. 1966). Ferment, 2011. Stainless steel, 56 feet x 35 feet. Purchase: acquired in honor of Martin Friedman and his critical role in the development of the Kansas City Sculpture Park through a gift from the Hall Family Foundation, 2011.1. © Roxy Paine c/o Marianne Boesky Gallery, New York. Henry Spencer Moore, English (1898-1986). Sheep Piece, 1971-72. Bronze, 13 feet x 19 feet x 13 feet. Lent by the Board of Parks and Recreation Commissioners, Gift of N. Clyde Degginger, 122.2010. This work is copyrighted. Contact Artists Rights Society (ARS), New York. Tony Cragg, English (b. 1949). Turbo, 2001. Bronze, 5 feet 6 7/8 inches x 5 feet 6 7/8 inches x 5 feet 6 7/8 inches. Purchase: acquired through the generosity of the Hall Family Foundation, 2001.26.2. © Tony Cragg. 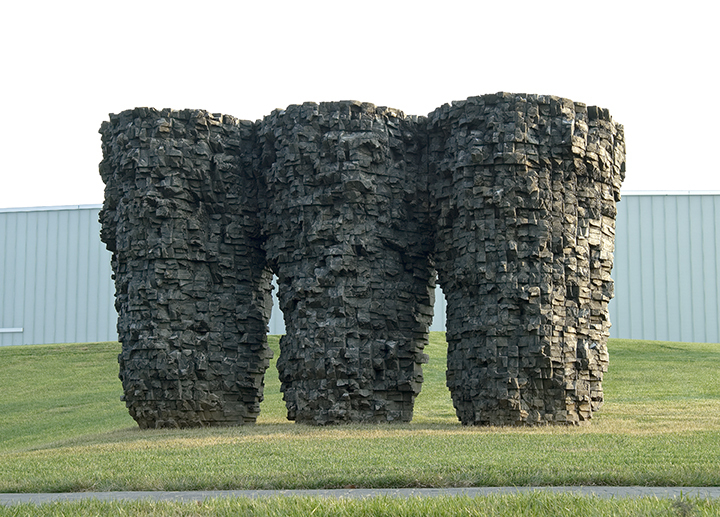 Ursula von Rydingsvard, American (b.1949). Three Bowls, 1990. Cedar and graphite, 9 feet 4 inches x 15 feet 10 inches x 8 feet. Purchase: William Rockhill Nelson Trust through the generosity of the Hall Family Foundation, the George H. and Elizabeth O. Davis Fund, G. Kenneth Baum, and Judy and Alan Kosloff, 99-9 A-C. © Ursula von Rydingsvard. Magdalena Abakanowicz, Polish (b. 1930). 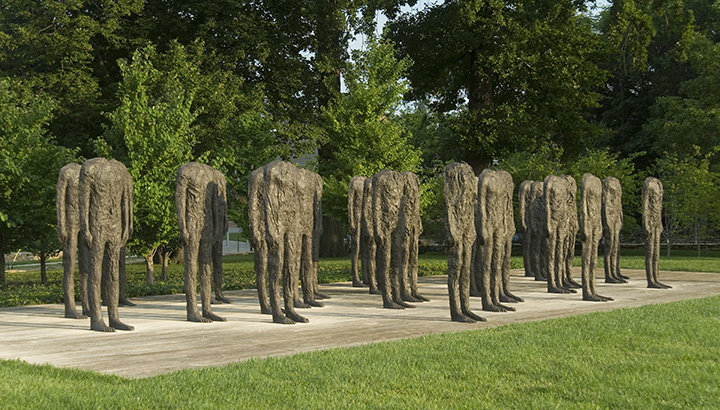 Standing Figures (Thirty Figures), 1994-1998. 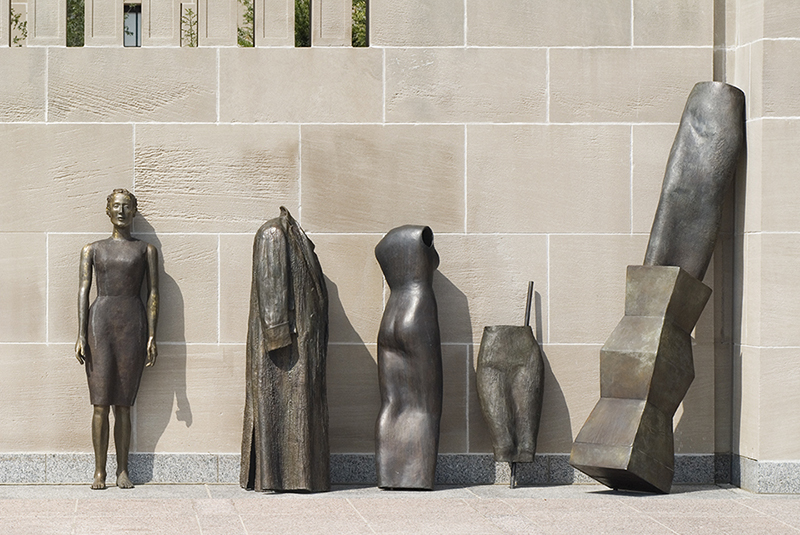 Bronze, A (figures): 6 feet 2 inches x 23 inches x 16 inches, B (decking): 54 feet 3 1/2 inches x 19 feet 8 1/2 inches. Gift of the Hall Family Foundation, F99-33/1 A-DD. © Magdalena Abakanowicz, courtesy Marlborough Gallery, New York. Henry Spencer Moore, English (1898-1986). , 1979. Bronze, ed. 3/9, 65 x 88 x 52 inches. Gift of the Hall Family Foundation, F99-33/12. This work is copyrighted. Contact Artists Rights Society (ARS), New York. Robert Morris, American (b. 1931). Glass Labyrinth, 2013. Glass, steel, bronze and stone, 50 x 50 x 50 feet. Purchase: acquired through the generosity of the Hall Family Foundation, 2014.13. © Robert Morris / Artists Rights Society (ARS), New York. Judith Shea, American (b. 1948). Storage, 1999. Bronze, A (a): 5 feet 6 inches x 18 inches x 12 inches, B (b): 5 feet 2 inches x 19 1/2 inches x 26 inches, C (c): 4 feet 10 inches x 16 inches x 20 1/2 inches, D (d): 42 3/4 x 14 1/2 x 15 inches, E (e): 7 feet 4 inches x 15 1/4 inches x 17 inches. Gift of the Hall Family Foundation, F99-33/77 A-E. © Judith Shea.